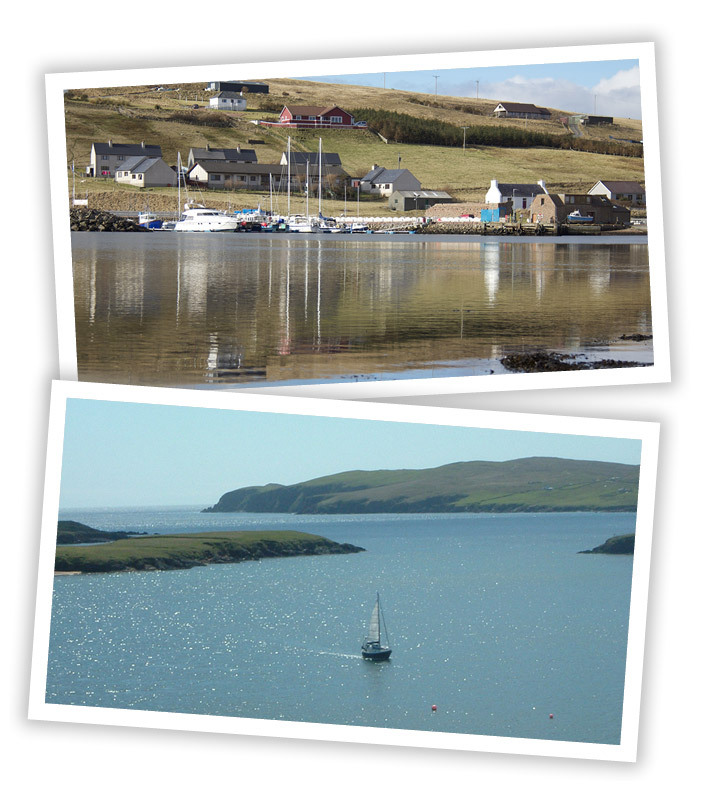 The picturesque village of Skeld is on the West side of Shetland and is one of Her best kept secrets. The views are quite spectacular. As you make your way into Skeld, you will not be disappointed. The beautiful marina and waterfront encompasses the campsite. The shore scape varies from the dramatic cliffs of the outer coast to long voes (sea inlets), which extend far into the heathery hills and green croft land. Whatever the wind direction, you can always find a sheltered beach. Many a day when the East coast of Shetland is smothered in sea fog, the Westside is gloriously sunny. It happens particularly in summer, when south-easterly winds pick up moisture from the North Sea: as the clammy air passes over the hills of Shetland it warms and dries, clearing away the mist. The old village of Skeld was a very busy place in the nineteenth century. Fish was landed at Skeld, salted, dried and then exported to Spain. This led to the employment of 50-60 men as sail makers, carpenters, coopers and blacksmiths. At the head of Skeld Voe is the congregational church built in 1863.